Each month the students at Solomon Plains Junior High School are recognized for their achievements. Some of the successes of these students are for academics, helping with morning announcements, being hard working and just being a model student. 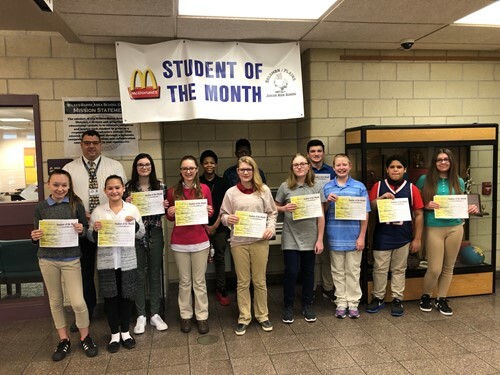 Those pictured for the January Student of the Month winners are, Jill Singer, Destina Brannigan, Sophie Styczen, Bethany Aberant, Amber Jones, Zach Perry, Michael Ruiz and Alexis Casterline. The back row, Mr. Tony Khalife, Principal, Kiera Kennedy, Ibin Wallace, Kevin Cherry and Jack Scavo. Thank you to the students for their efforts, the teachers for their nominations and Mr. Tony Khalife, principal for his continued support.